No, i'm not the "l337 Speak 2009 Champion." I PLA3D A GAM3 W1TH ZOMBIES 1N IT!! !1 is the name of an indie XBLA game that I purchased for download last night. It only costs 80 space bucks ($1). This game is a 'birds-eye-view' dual stick shooter. One stick moves you around and the other you use to aim and shoot. It's that simple. I don't even think you use any other buttons than that. 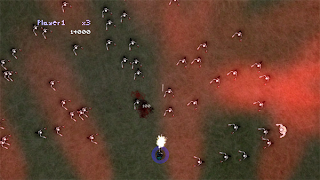 Wave after wave of zombies attack you... so you destroy them. That's the game. After only a couple minutes of playtime you might be convinced somebody has slipped LSD into your beverage because this games gets craaazy trippy. Like an ecstasy trip at a wild rave in London type of trippy. The music in this game alone is worth the 1 measly M$. The first song's lyrics are ridiculous. Grab this title, it's the #1 indie download for XBLA right now. Shouldn't be difficult too find.